What Are Slot Machines? - Casino Answers! 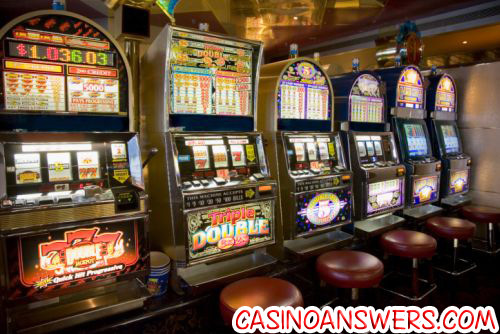 Casino Answers » Slots » What Are Slot Machines? Heh. Of all the casino related question we’ve received, this one had us re-reading just to make sure we we didn’t misread it. So you don’t know what slot machine are, do you? Well, here are slot machines:Play at this years #1 online casino for United States - Slots.LV. The reason this question surprised us is because it’s one of those things we take for granted – that everyone knows what a slot machine is. They are without a doubt the most popular game in casinos. Not only that, but you can find slot machines practically everywhere. Slot machines are commonly found in a lot of pubs or bars. In some of them you are allowed to gamble for real money, while other places offer video slot machines for recreational value only. However slot machines aren’t just restricted to bars and casinos – I was waiting on a flight at Manchester airport recently, and I killed the time by playing slot machines there. Yep right in Manchester airport, absolutely tons of them all over the place. 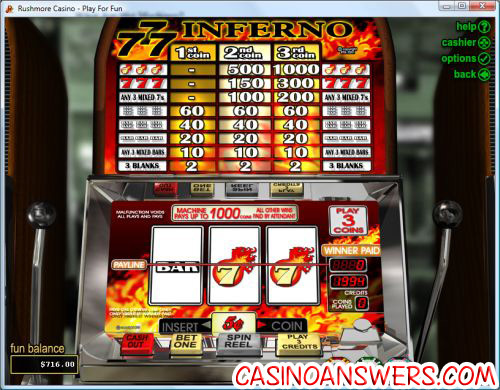 This is the Triple 7s Inferno slot machine, available at Slots Oasis Casino. You spin the reel, and you hope to get three symbols all lined up. The rarer symbols, such as the red 7s in the above example, will give you a higher payout. That’s really all slot machines are. Of course there are a wild variety of slot machines to choose from. Some slot machines have progressive jackpots, others have up to 90 paylines. However if you are looking to play some really cool slots, we highly recommend the interactive slots available at Slots Jackpot Casino. These slots are really cool – they are like interactive stories, and different from your usual slot machine. Check them out today. What is a slot machine? What does a slot machine look like?